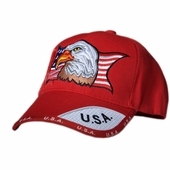 Honor our Military and Country with the American Eagle Patriotic cap! Available in assorted colors! The adjustable velcro closure allows for this cap to be one size fits most.